During the first half of the 19th century, the small kingdom of Denmark pursued an aggressive policy at sea. A British sneak attack shattered Danish naval power in 1801, and another attack on Copenhagen finished off the fleet in 1807. The Danes responded by planting 90,000 oak trees toward the Navy’s rebirth, but emerged from the Napoleonic Wars without a navy or the ancient union with Norway. But in 1848, the Danes responded to German nationalist efforts to take the German-speaking provinces of Schleswig and Holstein with vigorous resistance. The navy played a major role in the renewal of hostilities in 1850. Taking the German threat very seriously, Denmark was a leader in building first steam-powered and then ironclad warships during the late 1850s and early 1860s. The cruiser Heimdal at Copenhagen. Hostilities broke out again in 1864, and the Danish fleet blockaded the German coastline. When an Austrian squadron arrived in the North Sea to break the blockade, the Danes and Austrians fought off the island of Helgoland, then ruled by Britain. Both sides claimed victory: the Danes because they inflicted more damage on the Austrians than they suffered themselves, the Austrians because they forced the Danes to lift the blockade. The Danes also fought a drawn battle with the small Prussian fleet off Swinemunde in the Baltic. In neither case did the powerful Danish ironclads participate, though the turret ship Rolf Krake proved invaluable in keeping Prussian troops from crossing the narrow “Little Belt” strait between the mainland (Jutland) and the Danish islands. Denmark eventually had to surrender the two disputed provinces to the Austrians and Prussians, and though the fleet received several more ironclads after the war ended the kingdom remained at peace for the next 50 years. While some in the kingdom longed to recover at least Schleswig and pointed to the plight of Danish-speaking residents left on the wrong side of the border, no sane Dane sought a war against the ever-growing German Empire. The kingdom had flirted with such a move in 1870, forging a tacit alliance with France, but backed out of the operation when the French marines promised for the Danish front had to be flung into the struggle for Paris instead. During the late 1880s the Danes began to construct a series of armored coast defense ships similar to those being built in Sweden. Following Swedish practice, the Danes built their ships domestically, laying them down at Copenhagen Navy Yard and relying on Danish naval engineers for their designs. This kept the jobs generated within the Danish economy, but led to extraordinarily long building times. Danish mills could not supply high-grade armor plate and the Danes spread their orders around to maintain ties with all: The three heavy ships launched between 1896 and 1903 had armor supplied by English, French and German firms. Most heavy guns came from Krupp in Germany. Submarines came from Italy and Austria-Hungary. Iver Hvitfeldt, launched in 1886, was a very modern design for the time with a pair of 10.2-inch guns in barbettes fore-and-aft. She was rebuilt in 1904 with armored turrets. The Danish construction program proceeded very slowly, and a decade after Iver Hvitfeldt joined the fleet, the Navy laid down a large coast defense monitor named Skjold bearing a single 9.4-inch gun. She was an unusual design, with very low freeboard and a large round turret forward; similar in appearance to the small armored gunboats built in Sweden but much larger. The pace of Danish modernization began to pick up, and in 1898 the Danes began construction of the Herluf Trolle class of small coastal battleships. These carried a pair of 9.4-inch guns in single turrets fore and aft, with four 5.9-inch guns in casemates and a wide array of very light guns. Herluf Trolle was launched in 1899, Olfert Fischer in 1903 and the third ship of the class, Peder Skram, in 1908. These were small ships — 3,500 tons for the first two, 3,700 tons for the third — and all of very low speed but shallow draft. Among the islands of the Danish archipelago, they would provide heavy gunnery support to the flotillas of small torpedo boats built during the 1880's and replaced by more modern types starting in 1907. This doctrine was very popular in the years before the Great War, and many nations fielded a similar mix of forces. The Danes added submarines to the strategy in 1909 with the Italian-built Dykkeren. In 1910 they ordered three submarines from the Whitehead yard in Austria-Hungary, and built three more to the same design in Copenhagen. Five more were ordered in 1914 to a Danish design, giving the Danes the appearance of a powerful undersea force for a small navy. However, all the submarines were quite small and of very limited range and performance. Another coastal battleship, Niels Iuel, was laid down in September 1914. She was only slightly larger than Peder Skram, but featured a modern mixed coal/oil power plant like the newest German dreadnoughts and a heavier armament of two 12-inch guns. But her Krupp guns were seized for use by the German army as railroad artillery, and construction proceeded very slowly as Copenhagen navy yard struggled to maintain the ships on neutrality patrol. After the war the Allies would not allow Krupp to fulfill the contract, and the Danes instead bought ten 150mm (5.9-inch) guns from Bofors in Sweden, mounting them in shields. Launched in 1918, Niels Iuel was not completed until 1922. The coastal battleship Peder Skram, late in World War One. Denmark also fielded several cruisers, to show the flag in her Caribbean colony, the Danish Virgin Islands. The small cruisers Heimdal and Gejser were no more than gunboats, armed with two 4.7-inch guns each. The much larger Valkyrien was a protected cruiser carrying a pair of 8.2-inch guns, and in 1915 she was sent to St. Thomas as station ship, returning in early 1917 after the islands were sold to the United States. Austria-Hungary declared war on Serbia on 28 July 1914, initiating a series of such declarations as Europe exploded into open war. The Danish fleet mobilized on 31 July 1914 under command of Vice Admiral O. J. Kofoed-Hansen. Most of the navy’s major units had already been fitted out for the annual summer maneuvers, and they now would be assigned to enforce Denmark’s neutrality. The ships took up station in the three major waterways linking the Baltic Sea and the North Sea: “the Sound” between Sweden and the island of Sjaelland (where Copenhagen is located); the “Great Belt” between Sjaelland and the island of Fyn, and the “Little Belt” between Fyn and Jutland (the Danish mainland). The Great Belt and the Sound would have at least one coast defense ship and one cruiser on duty, supported by a flotilla of torpedo boats and one or two submarines. The Little Belt, much less useful for large ships, would be covered by torpedo boats and obsolete ships. When a Danish patrol found a German minelayer dropping mines in the Great Belt on the morning of 5 August 1914, the Germans demanded that the Danes take over the task themselves. That afternoon the Danish government issued a declaration closing the straits and announcing that they would be mined. Kofoed-Hansen then deployed his forces to cover the minefields and prevent their sweeping. The Danish action pleased the Germans greatly: German ships could easily transit between the North and Baltic seas via the Kiel Canal, but British ships would now have a much more difficult time entering the Baltic as would Russian ships attempting to exit. Though Denmark was officially neutral, this neutrality benefited Germany and the “Baltic Project” promoted by First Sea Lord Sir John Fisher (a forcing of the Danish straits to land troops on the coast north of Berlin) would have met Danish resistance and thrown the kingdom actively in to the Central Powers camp. Danish farmers in particular enjoyed a “good war,” as exports to Germany soared. The Danes reported 164 violations of their neutrality, the worst coming in August 1915 when the British submarine E15 grounded in the Sound and a German torpedo boat attacked her in Danish waters. The Germans ignored Danish orders to retreat and shot up the stranded sub, killing 15 of her crew. The German submarine U20, which had torpedoed the liner Lusitania in May 1915, ran aground in Danish waters in November 1916 and was a total loss though no one was killed. The Danes lost one of their own submarines in October 1916 when Dykkeren was rammed in the Sound by the Norwegian freighter Vesla. Eight of her crew escaped but her commander, Lt. Svend Aage Christensen, died while helping them out of the stricken boat. The wreck was salvaged and broken up. The Danes began sweeping their minefields within hours of the Armistice ending the war, causing their only surface ship loss of the war when the torpedo boat Svaerdfisken ran on a German mine. Soon only Herluf Trolle and Heimdal remained active, as the Danes decided to trust in the new League of Nations to prevent a new European war. The Danish fleet appears in Great War at Sea: Jutland with all of its warships, though the scenarios featuring them are strictly hypothetical. They are little more than a speed bump in the way of the British in the “Baltic Project” scenario, and also get to fight in a number of other “what if” engagements based on actual war plans. 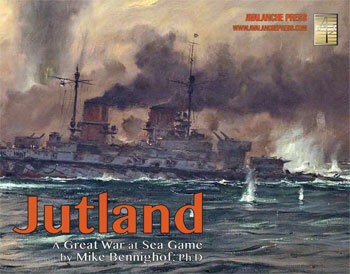 Click here to order Jutland right away.